The elegant Sphynx cat is named after the great sphinx of Egypt, a regal mythological creature with the body of a lion and the head of a human. You can see why these felines were named after the Egyptian legend as soon as you see their adorable faces and graceful nature. Despite their sophisticated looks, Sphynxes are playful and goofy pals. In fact, they are cats that sometimes act more like dogs. Sphynx cats are loyal and full of love for their humans and can often be spotted following them around or snuggling up while wagging their tail. Sphynxes stand out among other pets due to their lack of fur or hair – an uncommon occurrence among most mammals. Because of this, these non-furry felines love to snooze and sprawl out in sunspots for warmth whenever possible. They make excellent cuddle buddies and love to keep warm under the covers with their owners at night. But even though they would almost always rather be snuggling, Sphynx cats are natural athletes and playful pals. Sphynx cats get along well with other pets, too, and will even cozy up to dogs. While the ancient Aztecs bred hairless cats hundreds of years ago, the Sphynx cat we know today, is actually a Canadian breed originating from a random genetic mutation leading to hairlessness. Some breeders took a liking to a hairless cat and decided to breed individuals who produce consistently hairless offspring. The breed made its way to America and experts bred cats with this new-found “hairless” gene to create hairless Sphynx cats. The specialized breed took off and similar breeds now exist in other countries. The Sphynx breed is recognized by The International Cat Association, the Cat Fanciers Association, and several independent cat clubs in Europe, though their standards for the breed all differ slightly. 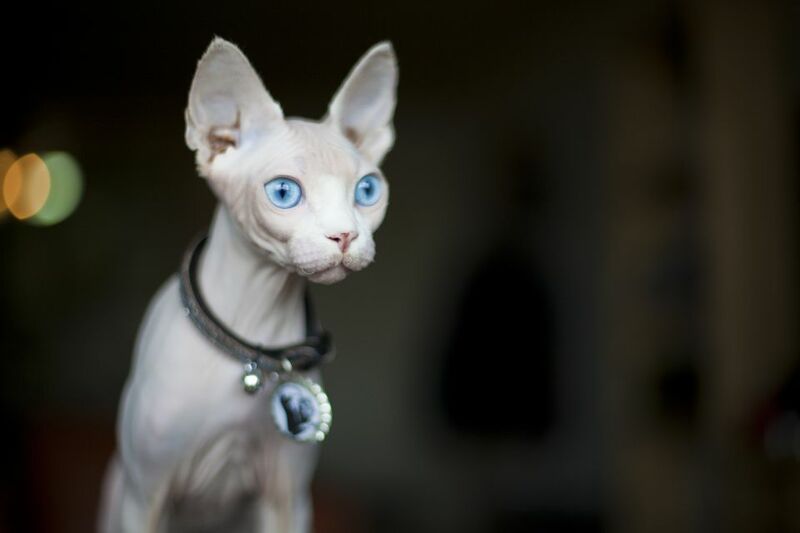 Some purebred feline registries will not recognize the Sphynx cat based on the idea that the breed’s hairlessness is a genetic abnormality that could be harmful to individual cats’ health and longevity. The Sphynx cat continues to be a popular pet choice in North America and is gaining popularity in western Europe. Though Sphynx cats are exceptionally active felines, their exercise needs are low. These cats are happy to entertain themselves for hours at a time. Sphynx cats love to play, jump, and may even play fetch once trained. Social and smart, Sphynx cats respond well to positive reinforcement training. Despite its hairless appearance, grooming is an important part of Sphynx care. Because they have no fur to absorb their body oils, the Sphynx cat’s skin must be groomed regularly to maintain a healthy balance of oil and prevent skin problems and oil spots on furniture. You should bathe your Sphynx cat at least once a week to remove oil build-up. Don’t forget to scrub in-between their plethora of wrinkles! Contrary to popular belief, Sphynx cats are not completely hypoallergenic. They may look hairless, but these cats are actually covered in a suede-like coat—talk about soft. Doctors do, however, recommend a Sphynx cat as a solution for cat-lovers who are only allergic to animal hair, not dander or oil. As for all pets, always ask your breeder for a health guarantee for your Sphynx kitten. When bred responsibly, Sphynx cats have a generally healthy outlook. Alas, certain conditions are always a risk. A common heart disease in cats called hypertrophic cardiomyopathy is a risk, as no one can guarantee their cats will never develop the fatal disease, not even selective breeders. Thankfully, the condition is rare. Sphynx cats are sensitive to sun exposure as they have no fur to protect their skin from harmful UV rays. Their direct sun exposure should be limited. Just like humans, these cats can get a sunburn if exposed to sunlight for too long. For this reason, Sphynxes should remain indoor pets or be monitored closely when outside. Sphynx cats are at risk for various skin conditions as well as gum health problems—another reason to groom them regularly. Weekly baths and teeth-brushings will do wonders to prevent Sphynx cat health problems. As highly social creatures, Sphynxes love to have a buddy. If you are away from home for most of the day, plan on getting two Sphynx cats. Sphynxes get along with other pets, too, so you can rest easy knowing they’ll be happy if you have another animal they can snuggle at home. Sphynx cats love food, and their potbellies will prove it. They’ll eat anything you offer them. That doesn’t mean you shouldn’t pay close attention to their nutrition, though. Sphynx cats have a high metabolism and a sensitive digestion system, so small meals in regular intervals throughout the day is ideal. Serving food this way prevents cats from getting disinterested with their meals, too. Dry cat food cleans cat teeth and protects gum health, but make sure your Sphynx has plenty of water to drink after a meal to prevent dehydration. Tougher cat chews can also be found at your local specialty pet store and work well to promote healthy gums. Some Sphynx cat owners opt for a raw food diet and claim numerous health benefits. Experts suggest a rotating diet of raw fish, like tuna or sardines, in addition to kibble and wet canned cat food. Otherwise, take a look at all of our other cat breed profiles.